A reader sent this wonderful photograph to us back in early December and I had been thinking about a way to share it with everyone. This seems to me a fitting space. Thanks Jim. Peace Rock was such an inspiring place for most everyone who saw it and it was a sad day when we realized it was gone. We here at the OB Rag want to thank the Peace Rockers for their tireless efforts in bringing the Peace Sign back to Ocean Beach and offer up big cudos to Doc, the Manager of the OB International Hostel, and the owner, John, who both supported the latest project here in OB. 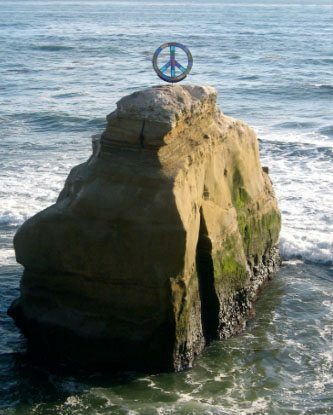 On Memorial Day weekend, 2006, a small group of long-time locals -calling themselves “Peace Rockers” – installed a stunning stained-glass Peace Sign atop the magnificent rock off the shores of Sunset Cliffs. No political statement was ever intended by the design. 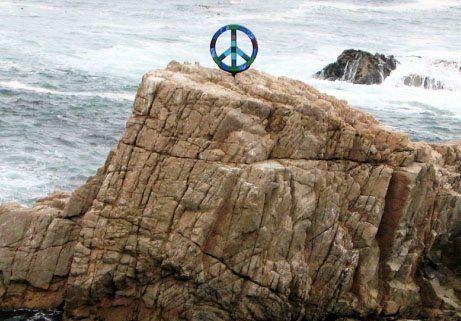 Rather, the Peace Rockers hoped the Sign would inspire a continual contemplation on tolerance, on harmony, and on the desire of all people for an end to violence. Regrettably, the sign was removed by persons unknown in the middle of the night in January of 2008, and was never returned. 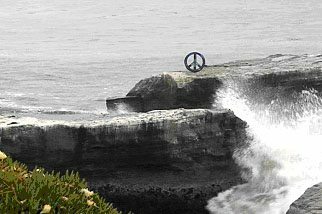 A second Peace Rocks installation went up in April of 2007 in Santa Cruz, California. Unfortunately, a larger-than-expected late spring swell washed the sign away shortly thereafter. A third sign was installed in Carmel, California, in July of 2008. That one lasted only a short time, and was removed by local Park Rangers. Encouraged by the generally positive reaction to their installation, but discouraged by the complications of maintaining a “guerilla” art project on public property, the Peace Rockers sought a sanctioned site in their hometown – Ocean Beach – for their fourth installation. They quickly settled on the O.B. International Hostel as the desired location, as its very existence is an embodiment of all of the international goodwill we hope the peace sign projects. An awesome sight, the brillant peace sign over so many flags of the world. Working anonymously through a representative on the Ocean Beach Town Council, the Peace Rockers made contact with the manager and the owner of the Hostel, and secured their permission for the present installation. 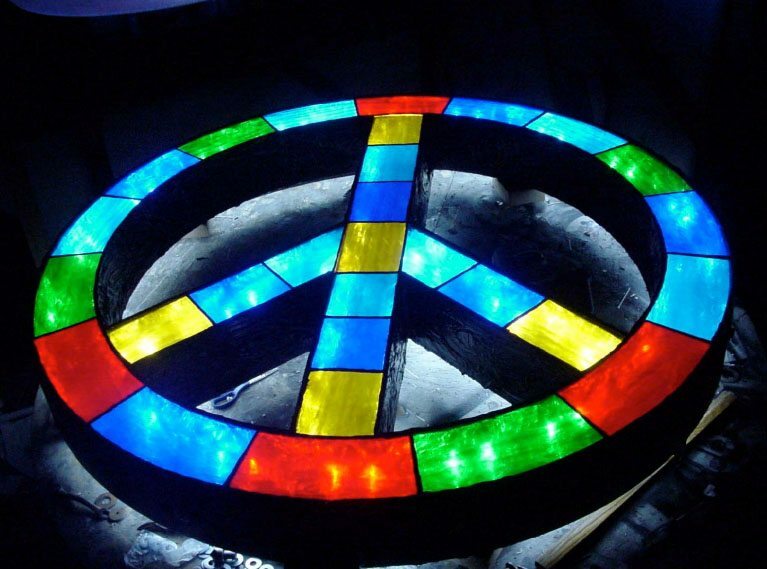 Now, on New Year’s Eve Day, 2008, the Peace Rockers make this sign as a gift to the community. Hoping for Peace on Earth and Goodwill Toward All, we wish everyone a Happy New Year! Peace Sign lights up the OB night! A great start to 2009. 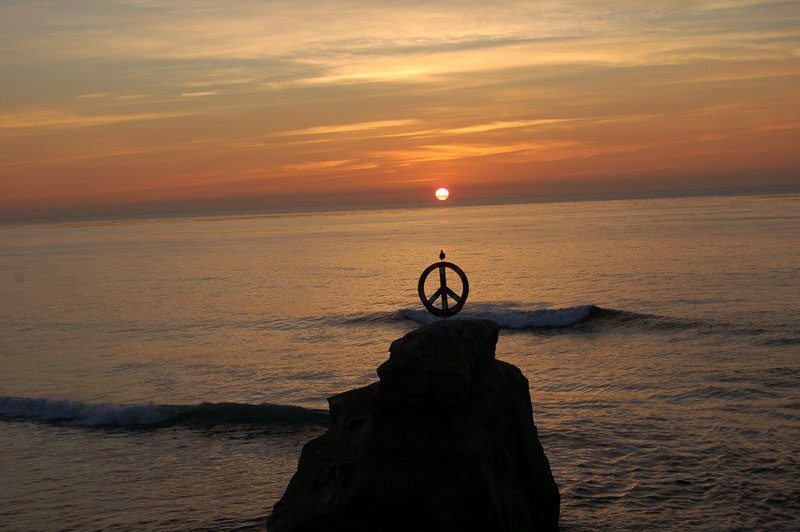 Peace Rockers…..I’d love to have one put up on my house and I am sure there are many others in OB that would do the same. If they are available please let us know. Thank you, OB Rag, for your support. Personally, I would love to see a Peace Sign atop every house in Ocean Beach, and encourage anyone who feels the same to construct your own design — from wood, from metal, from PVC pipe, from ANYTHING — and to display it wherever and in whatever manner feeds your own soul. The stained glass signs we have erected (first on Peace Rock, then in Santa Cruz, then in Carmel, and now on the Hostel) are VERY expensive to create, but we Peace Rockers are sufficiently encouraged by the overall positive reaction to our efforts that we are committed to installing as many more as we can find perfect places for, in California, or ANYWHERE else that would be truly inspirational. Peace Rocker – thank you so much for all your inspiration. Peace signs atop every house ! Awesome. I’m so glad we have our peace sign back. MY PAST GUESTS FROM SWITZERLAND AND HOLLAND WERE SO AMAZED AND AWED BY THE “ROCK PEACE SIGN”. WE THOUGHT WHAT A WONDERFUL STATEMENT TO OUR EUROPEAN NEIGHBORS! WHAT A LOSS TO SEE IT HAD GONE MISSING…AND WHAT A GREAT FEELING TO SEE IT MAGICALLY RE-APPEAR ON THE HOSTEL! CUDOS TO THOSE PERSISTENT ROCKERS! CHEERS TO THE OB HOSTEL! I AM SO PROUD TO LIVE HERE. PLEASE KEEP UP THE GREAT WORK! I’LL BE LOOKING TO GET A PEACE SIGN FOR MY WINDOW. Hardly Earth-shattering news here, but FYI we recently decided, in conjunction with the owner and Manager of the O.B. 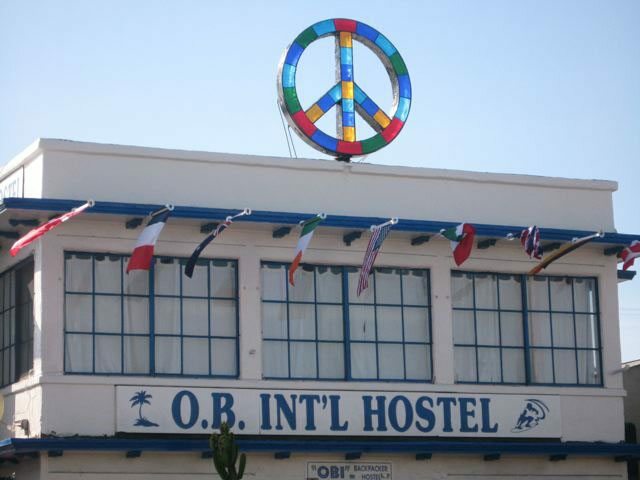 Hostel, to light the Peace Sign from dusk to dawn every day, rather than just the one hour (8:00 p.m. to 9:00 p.m.). Our thinking originally was that we did not want the sign to “dominate” the street, but now that the sign has “settled in” to its perch atop the hostel, we came to believe that we were missing half of our audience every day — the “night crowd” in O.B. — and that we should let the peace sign shine. So that’s all. We hope the community, at least MOST of the community welcomes the installation. For what it’s worth, we are now contemplating another “sanctioned” installation at another international hostel in San Francisco, but are also actively exploring other potential “guerilla” installations on rocks in the ocean. All ideas are welcome. Yeah, the sanctioned locations are a great way to let the people know how the community feels and it does me proud to see the peace sign atop the OB Hostel but, it’s the “guerilla” installations that put the biggest grin on my face. Kinda makes me feel like OB could secede from the nation, design our own flag (I have a few ideas), print our own currency (or simply do without) & live happily ever after. Any piece of sculpture that can make me feel like that is one powerful symbol. Gary, your comment made me smile as I recalled the days back in the mid-1970s when a bunch of us associated with the OB Community Planning Group (a forerunner to the Planning Board but not recognized by the City) were thinking just that – secede from the City. We looked into it, did some research. Some of us visited folks up in Venice in LA as they were looking into the same idea for their community as well. In the end, we determined there simply was not sufficient tax base here (as most of the community are renters) to fund our own municipality. (sigh)… it was/ is a great idea still, and is continually memorialized in the iconic bumper sticker: “US out of OB”. Hey anonymous, the Peace Rockers’ latest installation is atop the Ocean Beach Hostel. They decided against putting another one on Bird Rock, so other than the gulls, pelicans and cormorants the rock is pretty much an open forum again. Maybe someone will put up some new guerrilla art!